Updated February 1, 2018, to include pricing. Hyundai Kona: Make that four Hyundai SUV models by March 2018. Hyundai’s US sales are down this year and for one significant reason: the automaker lacks a tiny SUV, a model occupying the red-hot subcompact range. This week, the Korean automaker introduced the Kona, its first global B-segment SUV. An early 2018 arrival awaits the US-spec Hyundai Kona, following its rollout in Korea this month. It’ll be Hyundai’s fourth SUV, joining the compact Tucson along with the midsize Santa Fe and Santa Fe Sport models. Although late to market, the Kona should stem Hyundai’s recent sales drop as much of the brand’s 7.5-percent sales decline through May 2017 is due to its current product line skewing towards cars. Hyundai revealed the all-new Kona in South Korea on Monday. The new model has the same platform supporting its smallest car, the subcompact Accent and features a sharp, yet modern design. It offers a canvas closer to the Toyota C-HR, a slightly larger model that rolled out this Spring. Target customers are millennials, individuals who may be searching for their first new car. Hyundai must do battle with more established players, including the Nissan Juke, Chevrolet Trax, Honda HR-V, Jeep Renegade, Fiat 500X and the Mazda CX-3. Like the Kona, each of these models offers standard front-wheel drive and available all-wheel drive, powered by naturally or turbocharged four-cylinder engines. Among the exterior highlights of the 2018 Kona are its cascading grille, front LED lights, slim brake lights with turn signal indicators and reverse lamps, and floating roof look. The Kona’s profile features pronounced wheel wells, body sculpting, and available rocker panel trim. The roof has a two-tone color scheme for yet more differentiation in a crowded segment. Inside, you’ll find space for five, although seating is best for four. That said, Hyundai claims best-in-class interior space. The automaker utilizes an AVN (audio, visual, navigation) monitor for incorporating Hyundai Motor’s advanced infotainment features. The monitor design is such that it appears to float on the dashboard, enhancing this SUV’s open feeling. Further design elements of note include the mechanical air vents and functional button arrangement, what underscore the high-tech capabilities of the exterior. The AVN and HVAC (heating, ventilation and air conditioning) controls come encompassed by light, fluid details that advance the Kona’s relaxed habitat. Each model has high-positioned seats, including fold-flat rear seats. Hyundai will offer a pair of engine choices for the 2018 Kona, including a 2.0-liter with 147 horsepower and 196 pound-feet of torque. A six-speed automatic transmission sends power to the wheels. The second choice is a turbocharged 1.6-liter four-cylinder engine generating 175 horsepower and 132 pound-feet of torque. This one comes paired with a seven-speed dual-clutch transmission. Three driving modes — sport, normal, and eco are at the ready. Hyundai utilizes the two powertrains in other models, including the Sonata sedan. 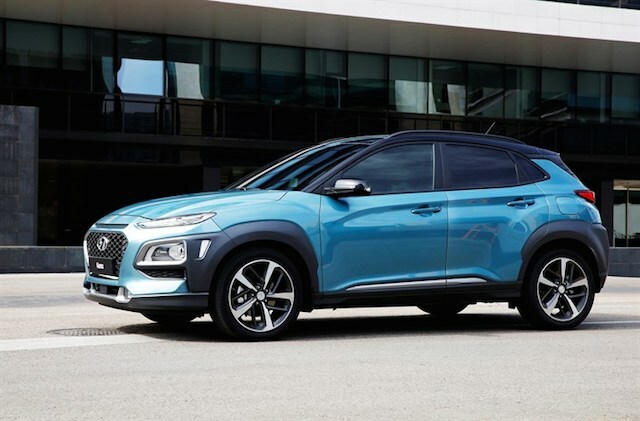 Hyundai promises different rear suspension systems for the two- and four-wheel drive models with the goal to deliver a comfortable ride and sporty handling. The automaker is also the only one to make its own steel, utilizing 51.8-percent advanced high strength steel for the Kona’s lightweight body frame. On the technology front, models will feature five-, seven- or eight-inch displays, HD Radio, a rearview camera, and 4G telematics. Apple CarPlay and Android connectivity, a head-up display (HUD), and audio system choices round out the available tech features. To sum up, the 2018 Kona is the right new model for Hyundai. As customers continue to flee coupes, hatchbacks, and sedans, the one glaring hole in the automaker’s product line will soon close. In January 2018, Hyundai announced pricing for the 2018 Kona. Available in SE, SEL, Limited and Ultimate trims, all models come with standard front-wheel drive and available all-wheel drive. A 2.0-liter inline-four with a six-speed automatic transmission powers the SE ($19,500) and SEL ($21,150); a 1.6-liter turbocharged four-cylinder engine paired with a seven-speed dual-clutch transmission motivates the Limited ($24,700) and Ultimate ($27,400) trims. Add $1,300 for all-wheel drive and $950 for the destination fee. The contrasting color roof, available on the SEL trim only, is a $150 upgrade.